Getting ready to plan your October? 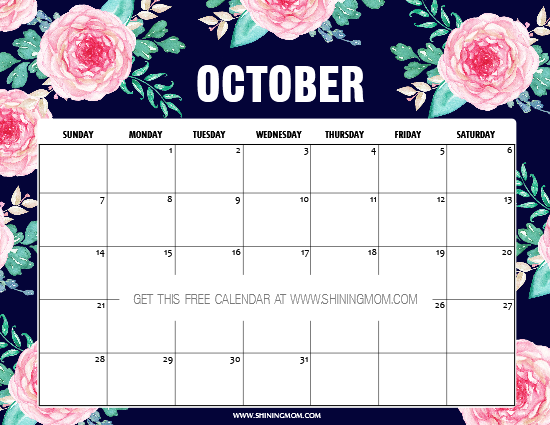 You’re going to love the free printable October 2018 calendar planners that I have created for you.They come in various themes and layout, all designed to make your planning a little bit more fun and a whole lot easier! Excited to view the calendars? Keep scrolling to view the 12 beautiful designs that you can all snag for free! Hi, friends! Welcome back to Shining Mom! I am so glad that you’re here! 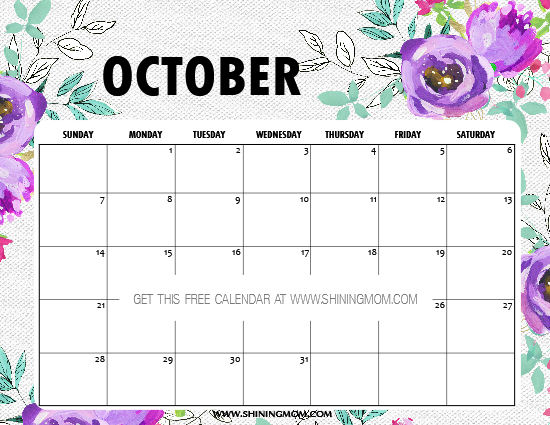 I am releasing your free printable October 2018 calendar planners early because I know this month is going to be a busy one for you. With all the festivities and your long list of to-do’s, you sure need to plan ahead. For those of you who have landed here at Shining Mom just now, allow me to welcome you warmly. Please know that I do release calendars and planners monthly and that you can print and download for free! My calendar releases have always been one of the most popular segments on the blog. I hope you will keep coming back for your copies, too! 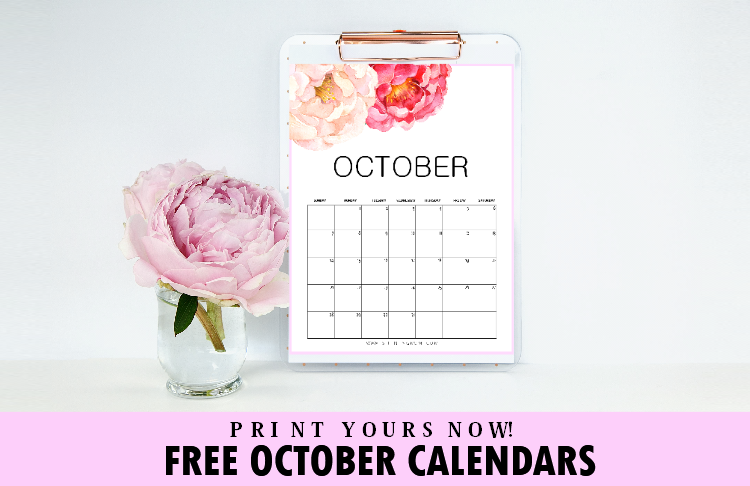 For today’s freebie, you are about to enjoy a dozen of free printable October 2018 calendar planners that all come in pretty designs that I am quite sure you’re going to love! FREE PRINTABLE OCTOBER 2018 CALENDAR PLANNERS: 12 AWESOME DESIGNS TO LOVE! You are about to enjoy 12 darling October calendars from me today. I made sure each calendar comes pretty in clean layout. Thanks to Creative Market and Design Cuts for the graphic elements I used in creating these calendars, designing has become so easy for me! Ready to view the designs and take your pick? A little heads up, the download link to the freebies is towards the end of the post… so keep scrolling til the very end! The first calendar that I am sharing with you comes in lush greens. This tropical-themed calendar is sure to bring in the refreshing vibe of dancing leaves in your daily planning. Get yours and print off copies for your home and office! In the mood for blue flowers? This second calendar is for you! Those fresh blooms are too beautiful, aren’t they? How blissful it will be staring on them while writing my daily action plans. This calendar design will sit prettily on desktops, print a copy today! Next up is another floral calendar, this time in pretty pink blooms. I love how the dark background contrasted with the dainty flowers! This is definitely a lovely calendar to use. How about printing it off for your kitchen?You can have this as your meal planner or activity planner for the home, it will stick beautifully on your fridge’s door. 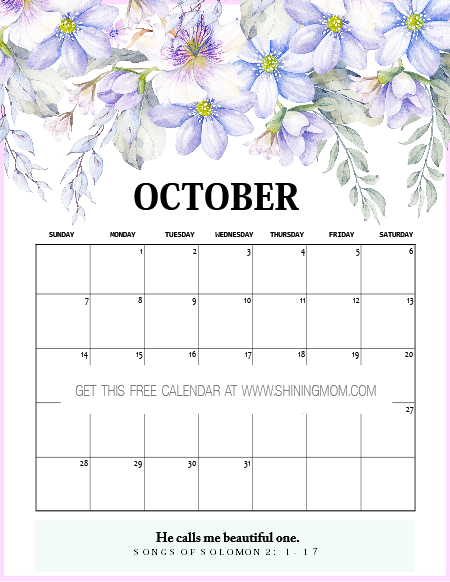 The next free printable October 2018 calendar that I have for you comes in charming purple and mint florals. This is another refreshing calendar design to use all through the month. Where do you think you can use this? I would love to have this pretty calendar as my blog editorial planner. How about you? That’s it for our first set of calendars. There are actually more designs to unfold in your download. Meanwhile, let’s move on to the oh-so-cute spooky calendars for Halloween! Hey, I’ve also created some cute Halloween-themed calendars for the little ones! If you’re looking for printables that you can use as countdown calendars for your upcoming Halloween party, snag these next ones for free! 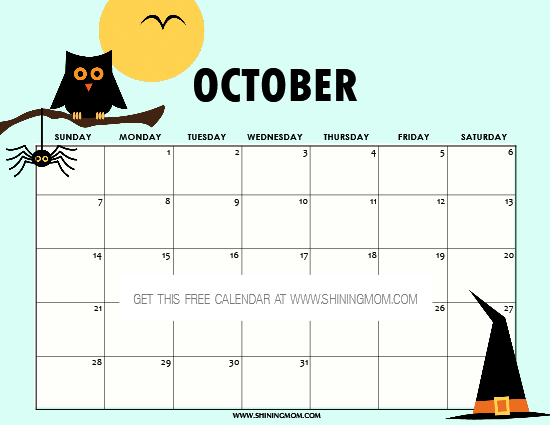 The free printable 2018 Halloween calendars that I have for you come in fun and cute designs. Let’s have a closer look at them. They will surely set you to the Halloween party mood! Calling all parents and teachers, get these freebies for the little ones who are oh-so-excited for the trick or treat! How many days till the Halloween party? 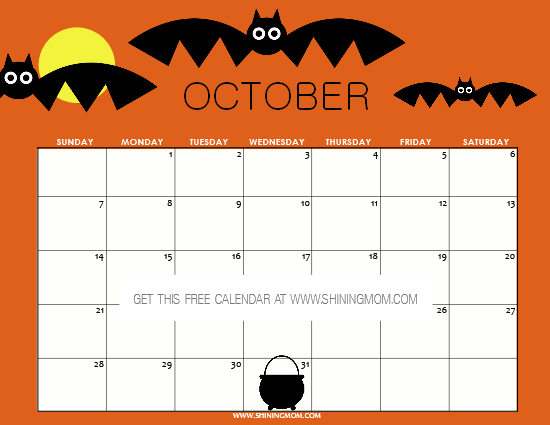 Here’s a bat-themed calendar that you can use for your party countdown! Woot! Woot! Woot! Next up is this owl-themed calendar is for the giggly kids out there. It’s in Halloween theme but it definitely doesn’t look too scary! Join the Shining Mom mailing list HERE and you will instantly receive the horizontal calendars in your inbox. The vertical calendars are available for instant download right over HERE. Choose which calendar designs to use. Print the calendars in 8.5×11 paper (US Letter) but should you like to use other sizes, do not forget to adjust your printer setting. Make sure to set your margins to “fit” setting, otherwise, your printed calendar will have a white border (which is just fine, actually). Use the calendar to plan a productive October ahead! LOVING THE OCTOBER CALENDARS? YOU’LL LOVE THE “MY WEALTH BINDER”, TOO. SPREAD THE LOVE. 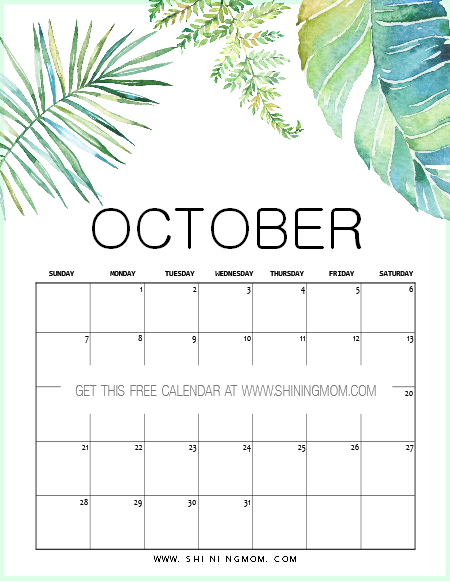 PIN THIS FREE PRINTABLE OCTOBER 2018 CALENDAR ON PINTEREST! Friends, Please take a second to pin this freebie on Pinterest so others can find the blog, too! I’ll be very delighted if you will. Thanks for your usual warm support! P. S. I have just released a new planner at Home Printables. Would you like to get it? It’s in this post. Have an amazing October ahead! « FREE Family Budget Binder & Why You Should Keep One!